Vietnamese food is known for fresh, healthy ingredients. And this soup, traditionally eaten for breakfast, is no different. With tons of fresh veggies and herbs to add to the top of the richly flavored broth, this soup will satisfy without weighing you down. This reedy herb is an essential ingredient in southeast Asian cuisine. Once cut, lemon grass has a citrusy, floral aroma similar to lemon zest or fresh ginger. Choose firm, pale green stalks, staying away from those that are dry or brown. For the spice bag, combine coriander, cloves, star anise, and cinnamon stick in a small, mesh drawstring bag or cheesecloth tied with kitchen string. Set bag in a 6- to 8-qt. slow cooker. For the pho, sauté onions, garlic, and ginger in oil in a sauté pan over medium heat until softened, 7–9 minutes; add to slow cooker. Add pork (and bone), broths, fish sauce, sugar, and lemon grass to slow cooker. Pour in water until liquid level almost reaches top of slow cooker; chill overnight. Place entire bunch of cilantro in slow cooker when ready to cook. Cover slow cooker and cook pork until fork-tender on high setting, 8–10 hours or low setting, 10–12 hours. Strain contents of slow cooker through a fine-mesh sieve into a large bowl; discard spice bag, cilantro, and lemon grass. Set pork aside. Pour broth back into slow cooker and set on low. Season broth with fish sauce and sugar. 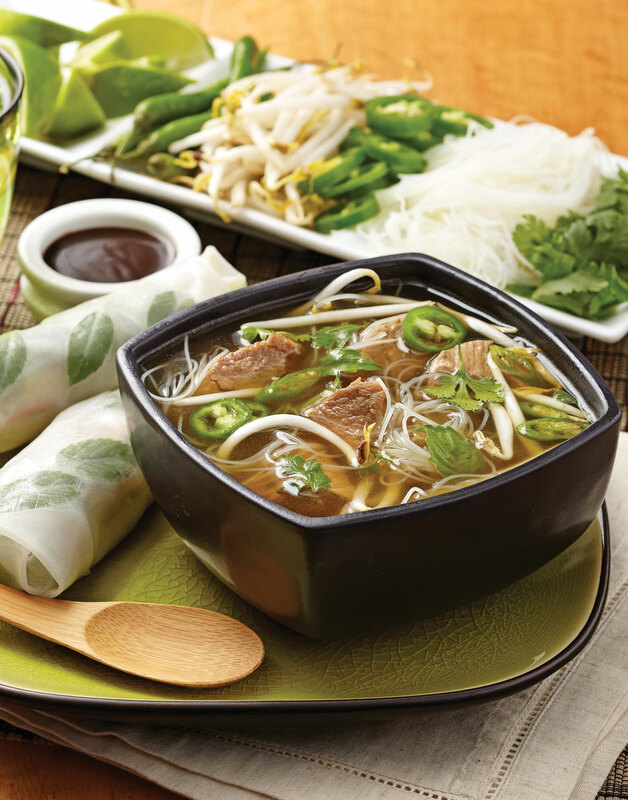 Place pork and rice noodles in bowls, ladle broth on top, then top with herbs and vegetables. Cheesecloth is great for holding the spices in the slow cooker. Just tie it up with some kitchen string. The pork bone provides lots of flavor and the collagen it releases gives the broth body.